A team of economists did some clever research focused on the impact of the Hajj—the pilgrimage to Mecca that two million Muslims make every year—not on Saudi Arabia, not on, like, the world, but simply on the people who go. The research design is straight outta Freakonomics: In Pakistan, more than 100,000 people apply for Hajj visas every year. Around 60% get them. The unsuccessful applicants form the perfect control group; compare their feelings about the world to their pretty-much-identical peers who snagged visas and made the Hajj, and voila, you have science. 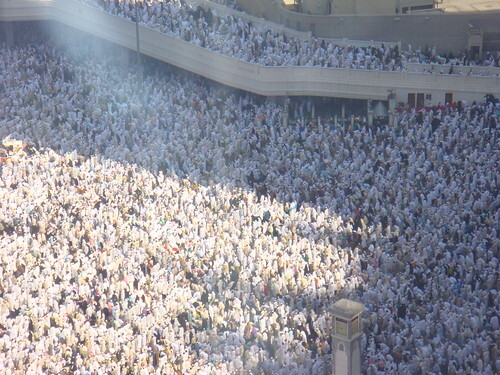 Our results support the idea that the Hajj helps to integrate the Muslim world, leading to a strengthening of global Islamic beliefs, a weakened attachment to local religious customs, and a sense of unity and equality with others who are ordinarily separated in everyday life by sect, ethnicity, nationality, or gender, but who are brought together during the Hajj. Although the Hajj may help forge a common Islamic identity, there is no evidence that this is defined in opposition to non-Muslims. On the contrary, the notions of equality and harmony appear to extend to adherents of other religions as well. These results contrast sharply with the view that increased Islamic orthodoxy goes hand in hand with extremism. We complement the harmony index by exploring the extent to which the Hajj leads to greater inclination to peace. […] Examining some of the component questions, we find that the Hajj almost doubles the number of respondents who declare that Osama bin Laden’s goals are incorrect, from 6.8% to 13.1%, and increases the fraction declaring his methods incorrect from 16% to 21%. cities of departure, and two types of accommodation that vary slightly in housing quality. A computer algorithm selects parties randomly from each stratum until the quota of individuals for that stratum is full. Reading this paper is an opportunity to reflect on just how intense the Hajj is these days. I mean, two million people! All pushed through the same space, at the same time. In the desert. The best description I’ve found of the event’s history and modern dimensions is in Steve Coll’s The Bin Ladens. A big part of the Bin Laden fortune came from building facilities in and around Mecca to support the crush of the Hajj. Think air conditioning, and lots of it. However, having said all that, I’m on a new Flickr hunt now. All the images we usually see of the Hajj are of the mind-blowing masses. But what about the dorky vacation photos? I like these images because they cut it back down to size. On some levels ,this is completely foreign. On other levels… it’s family vacation.